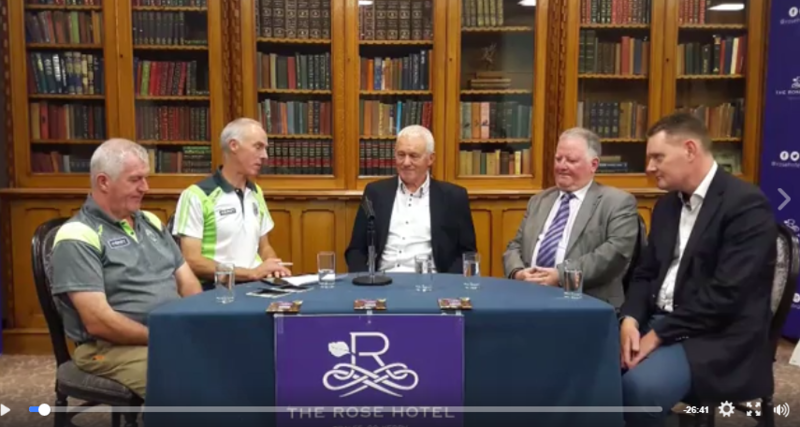 This week Kerry Gaa Tv was in the Rose Hotel Tralee. We had a special presentation to Maurice Leahy after many years service to Kerry Gaa and hurling . Tommy O'Connor and guests Ger McCarthy, Jerome Conway, Tim Murphy were in attendance. Former Causeway & Kerry hurler. Also former Kerry trainer, selector, manager and player/manager. Responsible for Kerry hurling coaching since 1989. Has overseen an extensive coaching programme in school, clubs and with county Development squads. All members of the current Kerry senior hurling squad have benefitted from his coaching expertise. Captained Causeway to the Kerry Senior Hurling Championship title in 1981. Fionnán Fitzgerald spoke to Colm Kelly about the County football club competitions which resume this weekend. Duagh and Lady's Walk play each other in the Kerry Junior Hurling Final. From Duagh Shane Driscoil & Brian O'Connell. From Lady's Walk John Paul Leahy. Don't forget if your club has a story to tell, you can organise a visit from Kerry Gaa Tv.